Baroque, Gerard Ter Borch d. Y. Portrait of a Lady, n.d.
Oil on panel, 60 x 39 cm. The portrait shows a well-dressed woman with red cheeks and lips, who looks out at the viewer with a mild and reserved expression. The woman in the painting is perhaps Geertruid Matthyss, an aunt of the artist’s wife. Unique to this composition is the hushed atmosphere and an excellent dynamic between the dark background and the light details. The dark, undefined space and the woman’s black dress stand in stark, dynamic contrast to her pale face, hands, and the details of her clothing such as the white collar, the golden jewellery and the orange ribbon. Characteristic of ter Borch’s simple, sophisticated painterly style is the very detailed and almost tactile reproduction of texture, such as the wide collar’s gossamer, transparent material and the matte silk of the dress. Ter Borch was an esteemed and wealthy Dutch painter. For many years, he focussed particularly on interior and genre painting, but he was also an excellent painter of portraits. His clients were primarily members of the upper middle class. Within the domestic tradition, ter Borch was inspired by a painter such as Frans Hals. He travelled for many years in numerous European countries, including England, Italy and Spain. Here, he was inspired by the art he saw, e.g. the Spanish court portrait style represented by a painter such as Diego Velázquez. 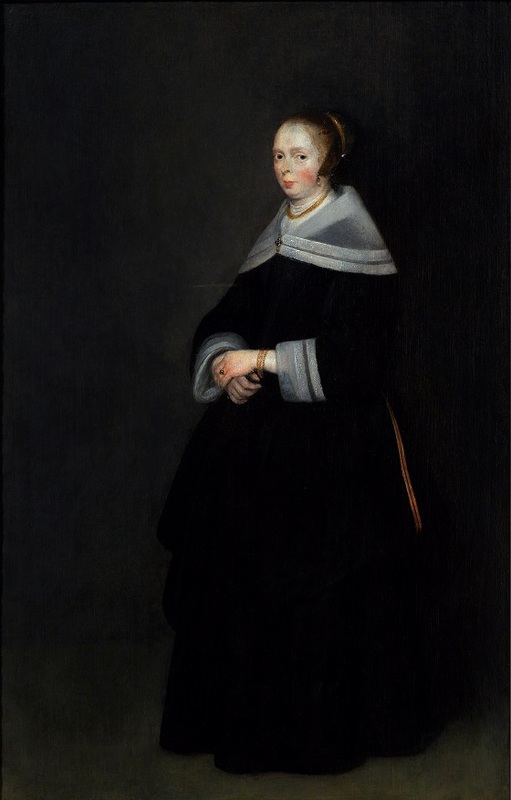 Ter Borch’s portraits are often full figure on dark, monochrome backgrounds and with tight, simple compositions.